Men, get over yourselves, buy boots. My friends over at The Post Family just launched their new brand-new site. That’s reason enough to write about them, but it just so happens that they also currently feature an interview with me. And if that wasn’t enough to run around and scream Hoooray, check out the below video Sam Rosen shot while he was visiting Studiomates just a few weeks ago. Boy, this is quite a monday. Studiomates from Sam Rosen on Vimeo. Thank you Chad! Thank you Sam and Leo! I am honored to have been interviewed by Alice Yoo of MY MODERN MET for the Content Curator’s series. 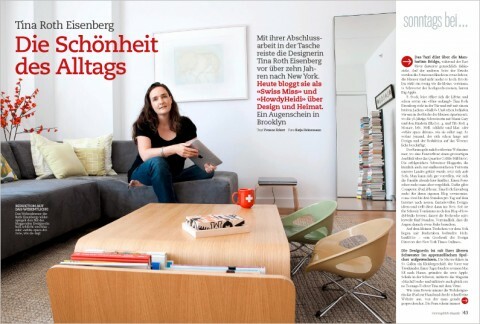 I had the honor to be featured in the swiss Sonntagsblick Magazin yesterday. A big thank you to the lovely journalist Yvonne Eckert and wonderfully talented and smooth photographer Katja Heinemann. A big hello to all new readers because of the article. Interested in reading the article (german only)? You can download the pdf here. 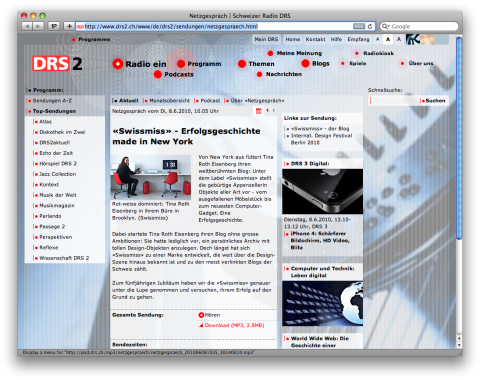 Karin Kamp did a brief interview with me for World Radio Switzerland. It just went live. A big thank you to Allegra Burnette and Glen Lieberman for their participation. 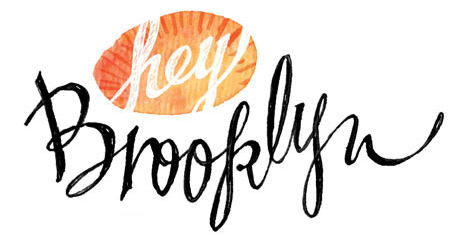 Charming Jake Bronstein took me on a Brooklyn Furniture Shopping Mission. And while we were looking for parking, he asked me some questions. Watch the video below or over on Fiestamovement. 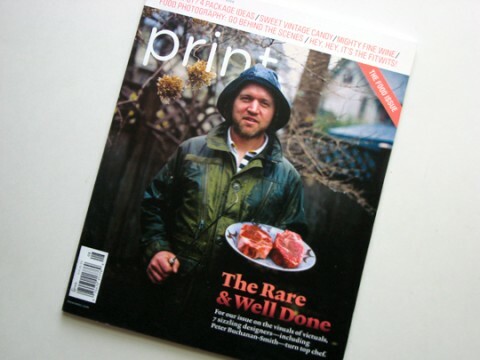 I am thrilled to be featured in the current Food issue of PRINT Magazine showing off my dad’s fondue recipe. You can see the article here on their brandnew website. A big thank you to the photographer, Ian Allen, who sat down with us after the shoot and enjoyed the Fondue. 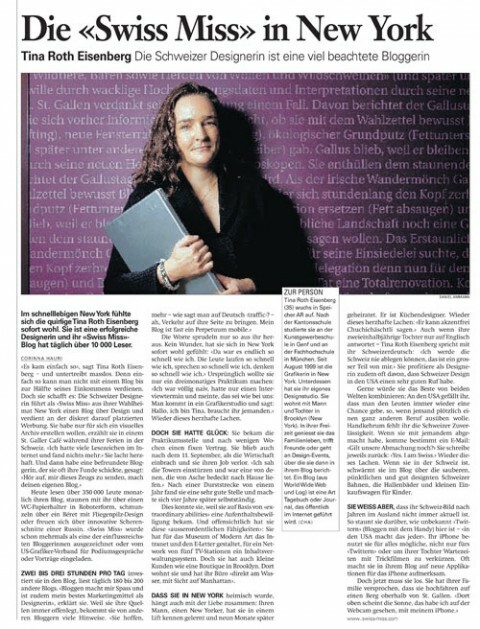 I am excited and feel honored by today’s article about me in the Tagesanzeiger, one of Switzerland’s biggest newspapers. (Even our little Ella Joy made it in the picture. Yay!) A big thank you to Katrin Hafner, the lovely journalist and the photographer Thomas Burla who both came out to the Appenzeller hills for the interview/photo shoot. 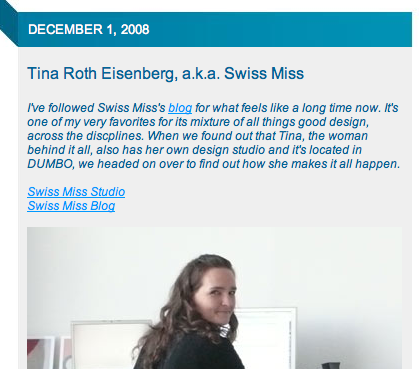 Tina Roth Eisenberg, aka swissmiss, is a Swiss designer living in New York. Her blog, swiss-miss.com, is not just hugely popular among young creatives, but also exactly the kind of break young unknown designers need to make it. 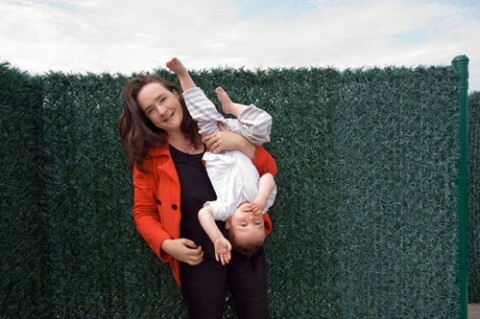 Whatever Tina posts becomes an instant hit. “You see that white house over there? That’s where I grew up.” Tina Roth Eisenberg is at the wheel as Appenzell, one of Switzerland’s most picturesque landscapes, flies by. She’s driving fast, she’s talking fast, she’s thinking even faster. Her laugh – HA! – is like a little explosion. Tina, a communications designer, moved to New York 10 years ago and has slowly but steadily made her way to the top of the design scene. 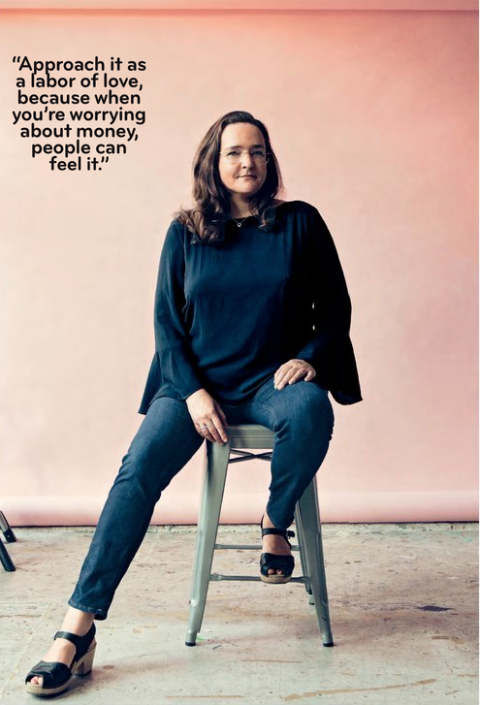 She has worked as a consultant for MOMA, is repeatedly asked to be on the jury of design competitions and headhunters are constantly at her heels. 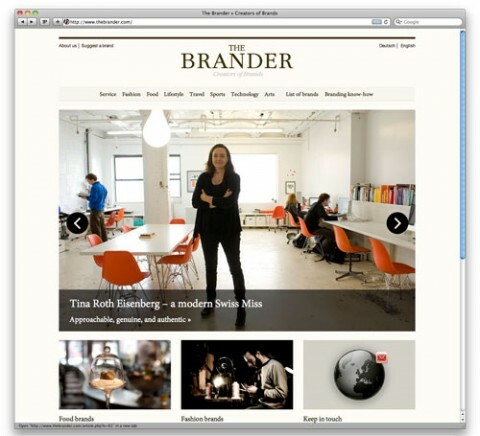 Today, Tina owns her own design studio in Brooklyn, where she also lives with her husband and 3 year old daughter. The girl from Switzerland has come a long way. Internet agent to the young, willing and able. 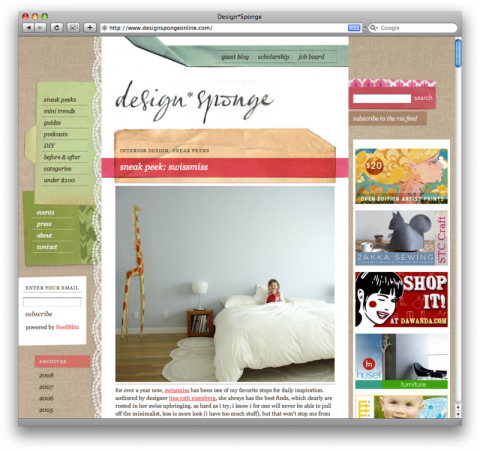 4 years ago, Tina started to feature design objects on her blog, mostly furniture, accessoires and books. She presents them with little text and amazing photos, and always makes sure to give credit to the artist or producer by linking to the respective websites. She definitely has a knack for finding good style on the web and whatever sparks her interest and curiosity or just plain makes her laugh appears on her blog. Whether it’s a drain stopper, a commercial for organic eggs from Swiss supermarket Migros or an interview with industrial designer Dieter Rams, it’s on there, and it’s neatly archived. This way, she manages about 30 new posts each day. Her blog is not about selling things. Tina believes in creativity and networking and made it her quest to feature other designers and creatives, for free. 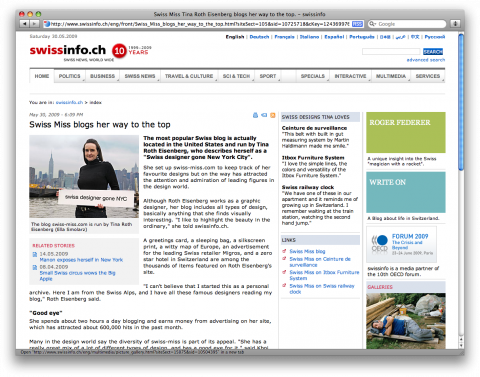 This is exactly what made her insanly popular, and rightly so: Her website swiss-miss.com is the single most linked Swiss blog ever. 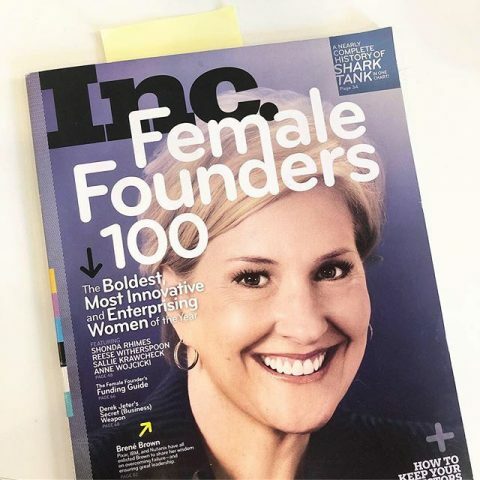 Her readership grows day by day, and by now, she has more than half a million clicks per month. This enables her to almost live off the network she created. 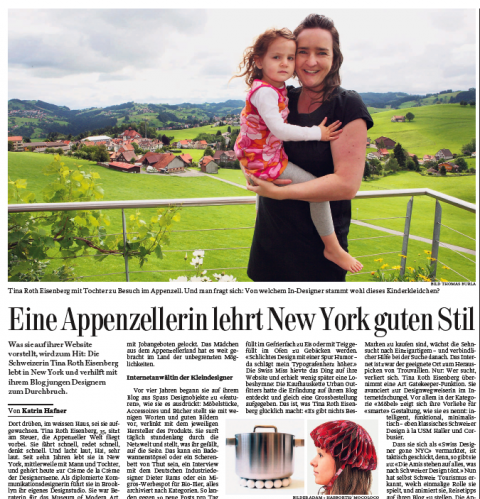 Tina is sitting on the terrace of her rental vacation home in Appenzell, Switzerland, surrounded by green hills and the sound of cowbells that make a nice change from NYPD sirens. She’s dressed in all black, with very little make-up and jewellery. Her iPhone and Macbook are nowhere to be seen, and inside her husband and daughter are having pasta. What exactly is good design, Ms. Roth Eisenberg? Pause. It’s totally subjective, she answers. Is she afraid of being considered an expert? “A lot of people expect way too much of me. I just point out what I love and think is amazing, that’s all”. But she does it in a totally consequent manner. Swissmiss constantly finds rare design gems on the web that nobody knows about and that you don’t see on any other blog. She boosts the economy by showing her very own style. People love that. 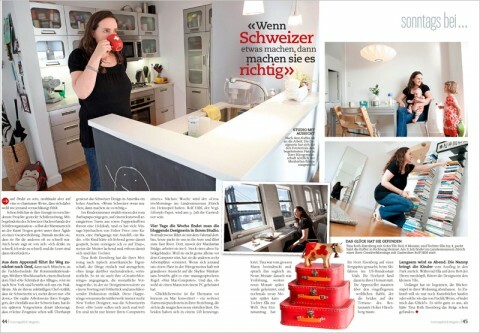 There are readers who gladly and proudly announce they furnished their whole appartment swissmiss style. In times of globalisation we all long for individuality, but we need help. The internet is a good way to go, but it is also enormous and you can easily get lost. Tina is sort of a gate keeper: She knows her way around the jungle and she is happy to help you out. Especially when it comes to furniture, her love for smart design is obvious: intelligent, functional, minimalist – classic Swiss design à la USM Haller and Corbusier. Pure luck is what brought Tina to New York, and she also refers to good luck when it comes to her amazing career. “I got lucky” she says, “after my Masters at Munich’s University of Art, I was looking for a 2 month internship in New York. 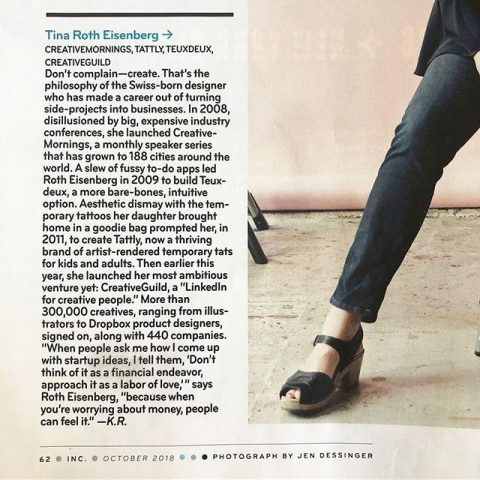 I got a working contract and a visa out of it.” She also lucked out when it comes to her upcoming lectures at the New York School of Visual Arts, or when she totally hit the hipster nerve with her Creative Mornings. Every month, Tina invites designers and everybody interested to a creative breakfast meeting, with presentations, Q&As, disussions, and the possibility to network. By now, these mornings in New York are booked solid within minutes after she announces them on her blog. Apparently the creatives of New York just long for personal contacts beyond their screens after all. And it seems we all just lucked out a little for knowing about swissmiss and her blog. And Tina? After all these years in New York, she still longs for her daily Swiss products. Before she gets on the plane back to Brooklyn, she always makes sure to stock up on deodorants, spices from Schmid-Metzg, and her favorite socks. HA! 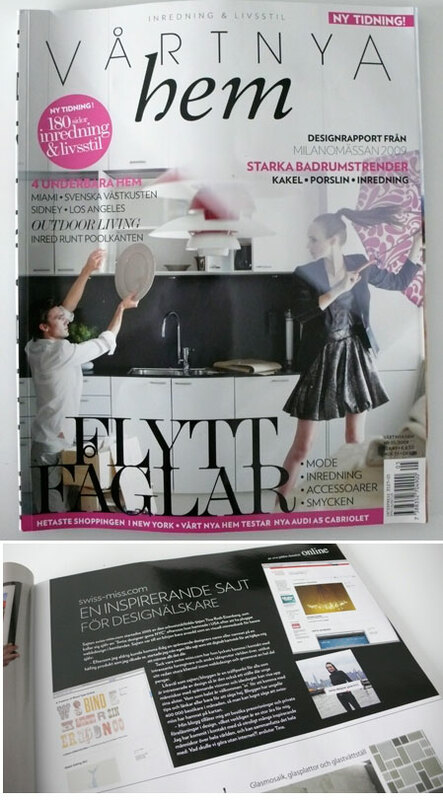 I just received a copy of “Vårt Nya Hem” (Our New Home), a Swedish Interior Magazine that features a small article on swissmiss. I don’t understand a word of swedish, so I just hope, it’s a nice article. Etsy gave me the opportunity to be a guest curator and show off some of my favorite picks. Have a look at what I’ve selected. Thank you Etsy! Rumplo asked me to pick a few of my favorite T-Shirts over on their lovelylovely site. 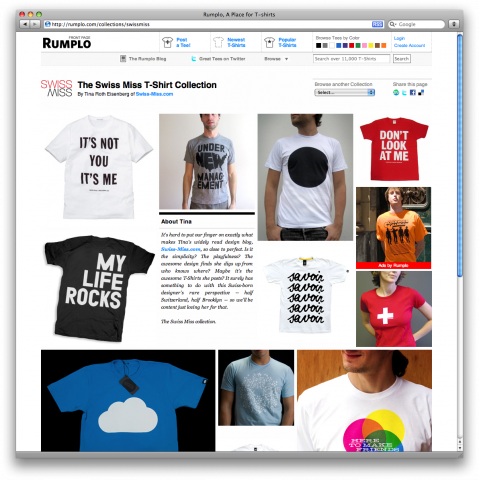 And I just noticed that the swissmiss rumplo collection has gone (semi-)live. Yay! What’s your favorite Tee on their site? Do tell! Tonight’s Pecha Kucha event was a fantastic experience. Even though I must say, I was flabbergasted once I saw the venue – not what I expected. It was incredibly loud, dark and there were no seats for the audience. Ever since I started the CreativeMornings 10Minute lecture series I have become really interested in the ‘packaging’ of an event and how it affects the experience. I wonder how this evening would have been perceived in a more quiet environment with seating for everyone and a noise level that would actually allow for a conversation. The unfortunate venue aside, I loved the event. The broad range of topics was intriguing and the quality of the 6min40second presentations was impressive. While it seems a bit forced at first, to have the slides timed on a 20second interval, it really does force the presenter to keep it short and to the point. Definitely a format I will keep in mind for upcoming presentations or events. Michael has a great summary of the event, read it here. Apple/AIGA Talk: Thank you for coming out. 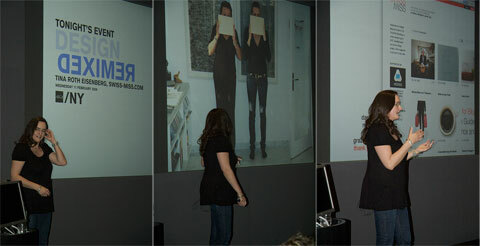 A big thank you to all my loyal swissmiss readers that came out to my AIGA/Apple talk last week. According to the organizers it was the biggest Design Remixed turnout they’ve ever had. Hooray! If you were there, let me know your thoughts: Was there anything you wanted to ask but didn’t? I’d love to hear your feedback in how I can improve the presentation for another time? Also, if you took pictures of the event, would you mind to add them to our flickr pool? Thank you so much! During our Christmas trip to Switzerland I met up with lovely Corinna Hauri Schuessler, a journalist of the Aargauer Zeitung, a big swiss newspaper. We had a wonderful 1 hour conversation over coffee which turned into this article (PDF) in yesterday’s newspaper. (german only) I am thrilled and feel honored. Thank you Corinna. Photo by Daniel Ammann. 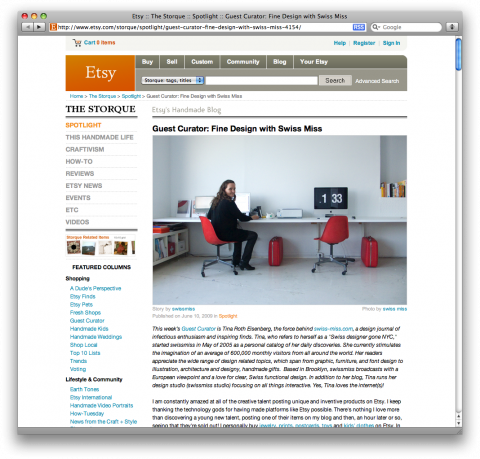 The ladies of DesignGlut just posted an interview they did with me here in the studio last week. You can read it here. 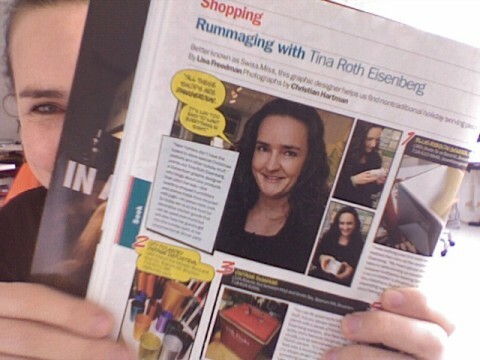 I just got my hands on one of the recent Time Out New York issues where I am part of a Shopping Feature on page 48. You can see the online version here. YAY! 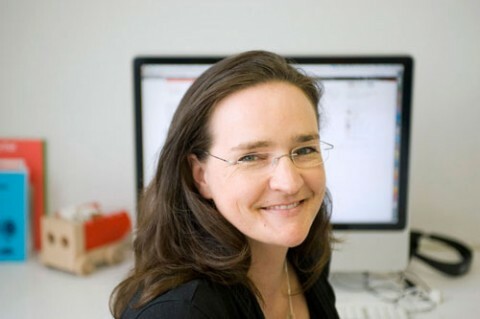 According to Home Rejuvenation swissmiss ranks at number 5 of the most 10 influential design bloggers 2008. Thanks to everyone that voted. Wheeee! 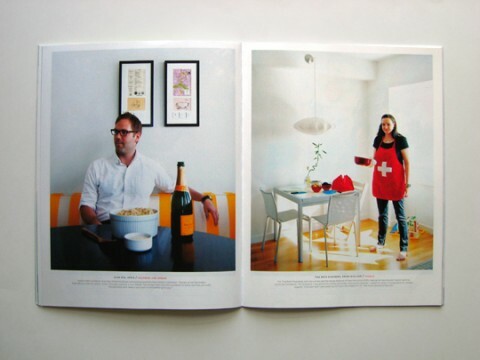 swissmiss home is featured as today’s sneak peek over on designsponge. Welcome design*sponge readers!